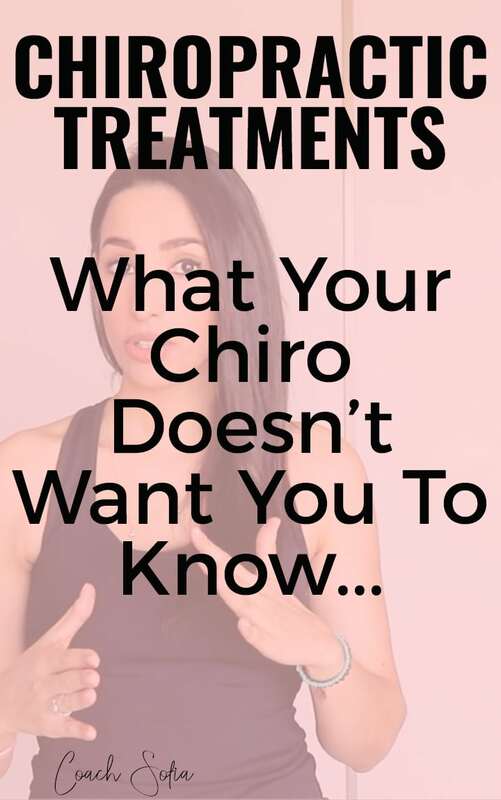 Today I want to share with you my honest, uncensored opinion about chiropractic treatments and why I think your chiropractor is unlikely to heal your back pain for good. My opinion applies to all other therapies as well. This post is going to be specific to chiropractic treatments and why I think your chiropractor probably won’t heal your back pain for good and what you need to do about it. I’m going to share what I learned from my experience and present some crucial points you need to be aware of if you’re already seeing a chiropractor to heal back pain or piriformis syndrome or if you’re planning on going to one. Before I start, I want to make something very clear. I’m not against chiropractic treatments or other therapies. I think they all have their place, and they can be very beneficial. So this is not a video to telling you not to try them. And many of them use hard selling tactics to push people into these long term plans that may not be very focused on long term healing. So I felt the need to discuss this today. So that you’re not becoming an ATM machine to these clinics. One of my most favorite chiropractors is Dr. John Bergman. He has a YouTube channel. And I love listening to his stuff. He shares phenomenal educational content and focuses on holistic healing. I highly encourage you to check out his channel. He’s an example of a good chiropractor. I actually emailed him personally and asked him if he can show me how I can find a good chiropractor? He was kind enough to email me back with a list of questions to ask the chiropractor’s clinic before using their services. How interesting is this? When you go to see a chiropractor or physiotherapist to heal your back pain, you don’t think about qualifying them. But think about it, you’re hiring THEM, and you need to make sure that they’re qualified enough and that people have successfully been healed using their services. I have enclosed the 7 questions to ask your chiropractor in this free guide to supplements this post which also includes 9 rules you must follow to make sure that your plan is designed for long term healing. Dr. Bergman said that if you have five questions out of the seven answered with a yes, then you know that you are with a good chiropractor. You need to qualify who you’re going to be working with. You can’t blindly trust someone just because he or she has a degree. You want to make sure whoever you’re hiring has had success healing people from chronic lower back pain, piriformis syndrome or whatever you’re seeing them for. If you read the reviews and notice that people are just continuing to see a certain therapist for years…that’s actually a bad sign. It shows that they still haven’t fixed that problem. Note: If you need help finding reviews for your doctor or therapist, check out this post where I show you my favorite free tool to review your doctor. Therapist, chiropractors and also pain management doctors see so many people a day. I have been to so many clinics where they would see me and another person at the same time. They’d leave the room and I could hear them talking to the other patient. And sometimes they’d see three people simultaneously. How can they really care and remember me seeing that many people? Personally, when I see my clients, I book two full hours. I need half an hour before the call to prepare, then I do the call with my client which can take up to an hour, and then another half an hour after the call to email them a summary of what we discussed, action steps and links to resources to support them. I’m focused for two hours on the following things…How can I support my client? What resources can I bring to them and how are they progressing? So I have a problem with these therapists or chiros who can’t even focus 20 minutes (sometimes the sessions are shorter) on their client. I actually remember a therapist who worked on the wrong hip throughout the whole session. When I told her, she apologized and offered me a second free session but that experience was a huge red flag. And I knew she didn’t even take a few minutes to review my file before seeing me. So use the massages and the adjustments to support your healing… as a ‘push’ in the right direction, but know that you’re gonna have to do 90% of the work. Because, at the end of the day, you are spending 99% of the time on your own. You need to first understand the root cause of your pain and your pain triggers, and you need to understand how to sit, stand, and lie down without triggering the pain. Then you want to add stability and support to your spine and hips. Once you do that, you’ll feel confident in moving and getting active without triggering pain, and you’ll be engaged in your healing so you can maintain a pain-free state. Just being passive all week, and relying on that one visit to fix you isn’t going to bring you long term healing. Because when you don’t understand what’s happening in your body and you don’t understand how to keep yourself pain-free, you’re going to always rely on external treatments to give you that quick relief. And I don’t know about you but I find it so empowering to feel that I am in control of my healing. To know that you can heal your body, you just need to know what to do and the tools to support your body heal itself. How you can remain in alignment for the rest of the week (if they’re doing adjustments)? How to move properly not to trigger the pain? Why do you keep getting out of alignment? (this is where they need to show you how to fix flawed movement patterns. Here’s what typically is happening right now…you get the adjustment, then you go back to real life and start doing all those things that created the postural imbalances, then you have to go back to the clinic to get another adjustment. Do you see the problem here? If the therapist or the chiropractor doesn’t give you a good answer… It just means that they either don’t want you to know – it’s sad, but maybe they just want you to keep coming back, or they genuinely don’t know. There are so many doctors or therapists who don’t have enough education in nutrition or strength training and posture therapies. Some people get their degree and just stop learning and don’t continue educating themselves. Sometimes you have to do that research on your own. Or you can hire a coach like me to help you with those things (building strength, restoring your muscles, correcting your posture). If you feel that there is resistance, or that maybe they’re not interested in showing you, please don’t be scared to go somewhere else. The next point I want to talk about is an important one. Because so many of these sports/injury rehab clinics are opening up in every corner. In order to get and keep their clients, they will push you into these three or six months, even nine months, treatment plans. I personally experienced this. On my first visit, they printed out the 6-month plan and asked me to start coming 2-3 times a week. It was until the day when he twisted my hips and I just screamed and left the clinic in tears. I couldn’t do it anymore. The worst part is he wasn’t listening to me and even though he saw how those adjustments were affecting me negatively he kept doing them. Your body and nervous system need time to heal and adjust. And even though I knew all this stuff, I kept going because I felt forced into it. In the end, I called and told them I was traveling and had to cancel all my future appointments. So please avoid this mistake. If something isn’t working after a few weeks and your body is giving you signals to take a break, you have to listen to your body. Tell your chiropractor you want to reduce your sessions to once a week so you can let your body adjust to those adjustments. And in the meantime, you can work on other things. You don’t want your whole focus to be the adjustments or the massages because those are passive treatments and you want to be active in your healing. And if you feel that your therapist or chiropractor isn’t helping you heal your back pain or piriformis syndrome, look somewhere else. There are good chiropractors out there, you just have to look and find them. Again, use the questions included in the free PDF to qualify them. Most of my current clients have had similar experiences with certain bad clinics, and I feel that people don’t talk too much about this. If you have a story you want to share or feedback on this, comment below. I’d love to hear your story. PS: If you’re struggling to add stability to your lower back and hips and you find that too many adjustments or stretches aren’t really helping you, consider grabbing the deep core mini-training. I guarantee you’ll feel more supported throughout the day and you’ll be able to avoid throwing your back pain every time you bend over, sit or stand.